We as a species are losing rich and diverse forms of interaction with nature: the awe, for example, of encountering an animal in the wild or a slug underfoot; or of sleeping under the night sky, or of even seeing the night sky in our urban settings. The loss is happening quickly (in terms of decades), and potentially impoverishing us as a species, physically and psychologically. Toward addressing this problem, we propose to characterize and give voice to 200 – 300 interaction patterns with nature: meaningful ways of interacting with non-human biological life and natural forms. Many of these patterns presumably emerged during the course of our evolutionary history. Thus, through this project we seek to expand the charter of biodiversity to include not only the cataloging and saving of species, but the identification and embracing of these diverse and deeply meaningful human experiences with nature – what we are calling "the biodiversity of human experience." 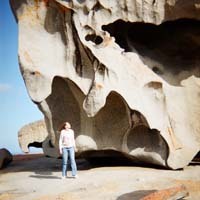 We have launched a website called A Nature Language as a research tool and public forum for people to share their personally meaningful experiences with nature. To share your own nature story and help us develop "A Nature Language," please click here. 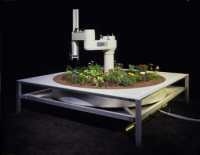 We investigated human interaction with a specific telerobotic installation: The Telegarden, a community garden that allows users to plant and tend seeds in a remote garden by controlling a robotic arm through a web-based interface. Based on an analysis of 3 months of associated online chat (347 participants, 16,504 postings), results showed the following: (1) conversations focused on nature (13%), technology (22%), and human relationships (69%); (2) patterns of conversation appeared to follow patterns of physical activity in the Telegarden; (3) as individual participation in the chat room increased, conversation decreased about nature and technology within the Telegarden and increased about nature and technology beyond the Telegarden; and (4) users did not personify the robot arm (or robotic installation). Discussion focuses on the emerging possibilities in human-robotic interaction of using telerobotics instrumentally to help foster healthy, life-affirming relationships with the natural world. The Telegarden is no longer active, but this link (http://www.usc.edu/dept/garden) provides further information about the online garden's development and history. This study examined preschool children’s reasoning about and behavioral interactions with one of the most advanced robotic pets currently on the retail market, Sony’s robotic dog AIBO. Eighty children, equally divided between two age groups, 34–50 months and 58–74 months, participated in individual sessions with two artifacts: AIBO and a stuffed dog. Evaluation and justification results showed similarities in children’s reasoning across artifacts. In contrast, children engaged more often in apprehensive behavior and attempts at reciprocity with AIBO, and more often mistreated the stuffed dog and endowed it with animation. Discussion focuses on how robotic pets, as representative of an emerging technological genre, may be (a) blurring foundational ontological categories, and (b) impacting children’s social and moral development. For further information, please see the publications related to this strand of research. This study investigated the interactions of 72 children (ages 7 to 15) with Sony’s robotic dog AIBO in comparison to a live Australian Shepherd dog. Results showed that more children conceptualized the live dog, as compared to AIBO, as having physical essences, mental states, sociality, and moral standing. Based on behavioral analyses, children also spent more time touching and within arms distance of the live dog, as compared to AIBO. 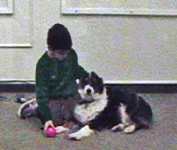 That said, a surprising majority of children conceptualized and interacted with AIBO in ways that were like a live dog. Discussion focuses on two questions. First, is it possible that a new technological genre is emerging in HCI that challenges traditional ontological categories (e.g., between animate and inanimate)? Second, are pervasive interactions with a wide array of “robotic others” – increasingly sophisticated personified computational artifacts that mimic biological forms and pull psychologically in mental, social, and moral ways – a good thing for human beings? Beck, A., & Katcher, A. (1996). Between pets and people. West Lafayette, IN: Purdue University Press. Kahn, P. H., Jr. (1999). The human relationship with nature: Development and culture. Cambridge, MA: MIT Press. Melson, G. F. (2001). Why the wild things are: Animals in the lives of children. Cambridge, MA: Harvard University Press. Myers, G. (1998). Children and animals: Social development and our connections to other species. Boulder, CO: Westview Press. According to the Census Bureau's projections, the elderly population will more than double between now and the year 2050 (to 80 million people). The question arises: How can we provide physical and emotional care for our increasingly aged population? One part of the answer may lie at the intersection of robotics and the human-animal bond. What we have in mind is this. Hundreds of clinical reports show that when animals enter the lives of aged patients with chronic brain syndrome (which follows from either Alzheimer's disease or arteriosclerosis) that the patients smile and laugh more, and become less hostile to their caretakers and more socially communicative. Other studies have shown that in a nursing home or residential care center, a pet can serve as a catalyst for communication among residents who are withdrawn, and provide opportunities (petting, talking, walking) for physical and occupational rehabilitation and recreational therapy. More generally, the research literature has established that the physiological health and emotional well-being of the elderly are enhanced by contact with animals (Beck & Katcher, 1996; Katcher & Wilkins, 1993; Center for the Human-Animal Bond). However, many elderly live in places that either prohibit pets or are not conducive to animals due to the physical layout of their buildings. In addition, some physiological conditions, such as Alzheimer's disease, may make animal ownership difficult for the individual and unsafe for the animal. Thus, is it possible that robotic pets - such as Sony's robotic dog AIBO - can provide the elderly with some of the physiological, cognitive, and emotional benefits of live pets? If so, then some advantages emerge. For one thing, since robots are not sentient, they would not be subject to neglect, as in the case of the live dog. For another thing -- with the advent of ubiquitous computing in the health care field -- it could be possible to embed health-related sensors in future robotic pets. Thus the robotic dog could someday be thought of as health-information data gathering and transmission system, as well as a "companion." As an initial foray into these possibilities, we are initiating a short-term and longer-term study in a senior residential setting. 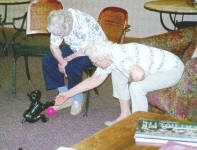 Our goal is to investigate the psychological effects of robotic pets in the lives of the elderly (cf. Kahn, Friedman, & Hagman, 2002). Katcher, A., & Wilkins, G. (1993). Dialogue with animals: Its nature and culture. In S. R. Kellert & E. O. Wilson (Eds. ), The Biophilia Hypothesis. (pp. 173-197). Washington, DC: Island Press. Analyze people's conceptions of robotic pets through their postings on three online AIBO discussion forums. In this study, we investigated people's relationships with AIBO, a robotic pet, through 6,438 spontaneous postings in online AIBO discussion forums. Results showed that AIBO psychologically engaged this group of participants, particularly by drawing forth conceptions of technological essences (75%), life-like essences (49%), mental states (60%), and social rapport (59%). However, participants seldom attributed moral standing to AIBO (e.g., that AIBO deserves respect, has rights, or can be held morally accountable for action). Our discussion focuses on how robotic pets (now and in the future) may (a) challenge traditional boundaries (e.g. between who or what can possess feelings), (b) extend our conceptions of self, companionship, and community, and (c) begin to replace interactions with live pets. We also discuss a concern that people in general, and children in particular, may fall prey to accepting robotic pets without the moral responsibilities (and moral developmental outcomes) that real, reciprocal companionship and cooperation involves. This research contributes to a growing literature on the human-robotic relationship. Kahn, P. H., Jr. (1999). The human relationship with nature. Cambridge, MA: MIT Press, Cambridge MA. Children are coming of age in an ever-changing technological environment in which artificial systems are being designed to mimic human appearance and behavior. In particular, robots are being designed to communicate with humans in a human-like manner. We believe that the inclusion of human-like robots in the lives of developing children may lead to new outcomes on processes of knowledge construction within the social domains. Thus, we are conducting this study with the hope that it will provide researchers and technology designers with new information about children’s social conceptions of robotic, humanoid technologies. We propose that Christopher Alexander's idea of design patterns can benefit the emerging field of HRI. We first discuss four features of design patterns that appear particularly useful. For example, a pattern should be specified abstractly enough such that many different instantiations of the pattern can be uniquely realized in the solution to specific problems in context. Then, after describing our method for generating patterns, we offer and describe eight possible design patterns for sociality in human robot interaction: initial introduction, didactic communication, in motion together, personal interests and history, recovering from mistakes, reciprocal turn-taking in game context, physical intimacy, and claiming unfair treatment or wrongful harms. We also discuss the issue of validation of design patterns. If a design pattern program proves successful, it will provide HRI researchers with basic knowledge about human robot interaction, and save time through the reuse of patterns to achieve high levels of sociality. In this paper, we move toward offering psychological benchmarks to measure success in building increasingly humanlike robots. By psychological benchmarks we mean categories of interaction that capture conceptually fundamental aspects of human life, specified abstractly enough to resist their identity as a mere psychological instrument, but capable of being translated into testable empirical propositions. Nine possible benchmarks are considered: autonomy, imitation, intrinsic moral value, moral accountability, privacy, reciprocity, conventionality, creativity, and authenticity of relation. Finally, we discuss how getting the right group of benchmarks in human–robot interaction will, in future years, help inform on the foundational question of what constitutes essential features of being human. Humans will continue to adapt to an increasingly technological world. But are there costs to such adaptations in terms of human well being? Toward broaching this question, we investigated physiological effects of experiencing a HDTV quality real-time view of nature through a plasma display ‘‘window.’’ In an office setting, 90 participants (30 per group) were exposed either to (a) a glass window that afforded a view of a nature scene, (b) a plasma window that afforded a real-time HDTV view of essentially the same scene, or (c) a blank wall. Results showed that in terms of heart rate recovery from low-level stress the glass window was more restorative than a blank wall; in turn, a plasma window was no more restorative than a blank wall. Moreover, when participants spent more time looking at the glass window, their heart rate tended to decrease more rapidly; that was not the case with the plasma window. Discussion focuses on how the purported benefits of viewing nature may be attenuated by a digital medium. We installed large plasma displays on the walls of seven inside offices of faculty and staff at a university, and displayed, as the default image, real-time HDTV views of the immediate outside scene. Then, utilizing a field-study methodology, data were collected over a 16-week period to explore the user experience with these large display windows. Through the triangulation of data—652 pages of interview transcripts, journal entries, and responses to email inquiries—results showed that users deeply appreciated many aspects of their experience. Benefits included a reported increase in users’ connection to the wider social community, connection to the natural world, psychological wellbeing, and cognitive functioning. Users also integrated the large display window into their workplace practice. However, users expressed concerns particularly about the impacts on the privacy of people whose images were captured in the public place by the HDTV camera. Discussion focuses on design challenges for future investigations into related uses of large displays. Digitally capturing and displaying real-time images of people in public places raises concerns for individual privacy. Applying principles of Value Sensitive Design, we conducted two studies of people’s social judgments about this topic. In Study I, 750 people were surveyed as they walked through a public plaza that was being captured by a HDTV camera and displayed in real-time in the office of a building overlooking the plaza. In Study II, 120 individuals were interviewed about the same topic. Moreover, Study II controlled for whether the participant was a direct stakeholder of the technology (inside the office watching people on the HDTV large-plasma display window) or an indirect stakeholder (being watched in the public venue). Taking both studies together, results showed the following: (a) the majority of participants upheld some modicum of privacy in public; (b) people’s privacy judgments were not a one-dimensional construct, but often involved considerations based on physical harm, psychological wellbeing, and informed consent; and (c) more women than men expressed concerns about the installation, and, unlike the men, equally brought forward their concerns whether they were The Watcher or The Watched. The understandings of and interest in the environment of children in an inner-city black community were studied. To investigate their environmental moral reasoning, children's evaluations and supporting justifications were assessed regarding a hypothetical scenario that involved polluting a local waterway. Seventy-two children, 12 males and 12 females from each of 3 grade levels (1, 3, and 5), from a Houston (Texas) elementary school were interviewed. Virtually all were black, and most received the free lunch program. Subjects' general environmental knowledge and attitudes were evaluated, and questions were asked about the hypothetical polluting of a bayou near the school. Results confirm the personal and moral importance that the environment has for these inner-city children. They have talked about environmental issues in their homes and are aware of the problems of pollution. Environmental harm matters to these children, and they view polluting the bayou as a violation of a moral obligation. The constraints of living in the inner-city have not diminished their appreciation for nature. This study investigated how urban and rural children who lived along a major river in Brazil understand and value their relationship with the natural environment. Forty-four Brazilian children in fifth grade were interviewed, and background of the city and village they lived in was ascertained. Each child was individually administered a semi-structured interview. The issues under investigation focused on children's: (1) awareness of environmental problems; (2) beliefs about whether certain acts of environmental degradation harmed various parts of nature; (3) concern if such harm occurred; and (4) environmental actions. In addition, a hypothetical scenario was presented to assess the presence or absence of moral obligation in demonstrated environmental sensitivities and commitments based on a wide range of measures. Additional analyses showed striking similarities between this Brazilian population and a population of African-American urban children in the United States interviewed in an earlier study with comparable methods. The study considered the moral developmental theory, which supports the proposition that, in important ways, individuals' moral reasoning across cultures is similarly structured by concerns for human welfare, fairness, and rights. This study investigated children's moral and ecological conceptions and values about an actual, environmentally destructive accident, the large oil spill that occurred in Prince William Sound, Alaska in 1989. Sixty children from second, fifth, and eighth grades were interviewed on children's reasoning and understandings about the oil spill which caused extensive environmental harm. Questions focused on children's understandings and valuing related to the effects of the oil spill, children's morally obligatory reasoning about the oil spill, children's justifications, and children's conceptions of what it means to live in harmony with nature. The findings showed that the large majority of the children understood the oil spill negatively affected the local environments, it mattered to the children personally that harm occurred to the environments, and children distinguished between harm wrought to marine life by human activity and by other aspects of nature. The majority of children conceived of the harm caused to the shoreline as a violation of a moral obligation. Children in grade two less often generalized their prescriptive judgments compared to the children in grades five. Twenty-four black parents from Houston were interviewed for their perspectives on nature and environmental education. Four overarching questions addressed the importance of nature, environmental concerns, environmental practices, and views toward environmental education for their children. Parents spoke of commitment to environmental issues and enjoyment of nature; they remained vividly aware of difficulties arising from urban poverty. In this study, farm worker children (N = 40) in second and fifth grade were interviewed about (a) their conceptions and judgments of pesticide exposure and (b) their reasoning about the moral standing of nature. First, results showed that all participants negatively judged pesticide exposure based on moral obligatory criteria. Yet, most children accepted pesticide use in the orchards where they lived. Their reasoning was either based on assumptions that certain practices eliminated potential harms or coordination of potential physical harms with concerns for financial security. Second, participants expressed biocentric considerations (wherein nature is accorded moral standing) when reasoning about harms to nature. The results provide evidence of biocentric reasoning earlier than previously shown in the developmental literature, and indicate a developmental shift in the form of biocentric reasoning. Finally, the results offer support of a new methodology for disentangling human considerations from environmental moral reasoning. © 2016 Department of Psychology, University of Washington. All rights reserved.